This article is written by Lawrence Kane. 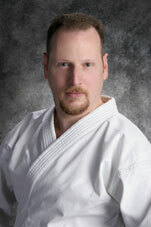 Lawrence is the author of Martial Arts Instruction: Applying Educational Theory and Communication Techniques in the Dojo (YMAA 2004). Over the last 30 or so years, he has participated in a broad range of martial arts, from traditional Asian sports such as judo, arnis, kobudo, and karate to recreating medieval European combat with real armor and rattan (wood) weapons. He has taught medieval weapons forms since 1994 and Goju Ryu karate since 2002. He has also completed seminars in modern gun safety, marksmanship, handgun retention and knife combat techniques, and he has participated in slow-fire pistol and pin shooting competitions. Since 1985 Lawrence has supervised employees who provide security and oversee fan safety during college and professional football games at a Pac-10 stadium. This job has given him a unique opportunity to appreciate violence in a myriad of forms. Along with his crew, he has witnessed, interceded in, and stopped or prevented literally hundreds of fights, experiencing all manner of aggressive behaviors as well as the escalation process that invariably precedes them. He has also worked closely with the campus police and state patrol officers who are assigned to the stadium and has had ample opportunities to examine their crowd control tactics and procedures. Lawrence lives in Seattle, Washington . This article examines the some aspects of US law as they apply to karate and self-protection. I'm very grateful to Lawrence for sharing this article with members and visitors to this site. Disclaimer: nothing in this article constitutes a legal opinion nor should any of its' contents be treated as such. While the author believes that these guidelines are accurate, any questions regarding specific self-defense situations, legal liability, and/or interpretation of federal, state, or local laws should always be addressed by a trained attorney. Important note: This article discusses aspects of US law in general and Washington State law in particular. All readers are encouraged to be aware of, and to adhere to, the law as it relates to self-protection in their own country and locality. Let's face it practitioners of the martial arts, even those whose primary goal is not self-defense, learn dangerous, even deadly techniques. Those of us who teach these skills have an obligation to help students understand not only how to hurt someone, but also when it is appropriate to do so. In our dojo, advancement beyond go (5th) kyu requires an understanding of the legal aspects of karate. This article summarizes the essence of the law as it applies to countervailing force. Karate, as with most similar disciplines, is first and foremost a defensive art. Every kata in Goju Ryu, the style I practice, begins with a defensive movement. This essential tradition is best described by Funakoshi's famous saying, "karate ni sente nashi" which translates as "there is no first strike in karate." This convention helps practitioners of potentially lethal arts behave in a manner appropriate to interaction within polite society, something I think we'd all agree is a positive thing indeed. To ensure clarity, however, cutting off an attack before it is fully in play (sen sen no-sen for those of you who recognize the Japanese expression) looks like a preemptive strike but is still a defensive movement. In this fashion practitioners sense that an attack will be forthcoming and then cut it short before the opponent has the chance to transform the mental desire to attack to the physical movement necessary to execute that desire. Martial practitioners study their art for physical conditioning, mental discipline, personal growth, and self-defense purposes. The ultimate goal of the serious budoka should never be the ability to go around beating people up. In fact, I would assert that the more dangerous you really are the less you should feel a need to prove it. The best martial artists I know are quiet, unassuming individuals who avoid conflict whenever possible. The only way to guarantee victory in a physical confrontation is to walk away before the first blow is thrown. Although martial artists train to survive or even triumph in a fight, I believe that practitioners should do everything they can to avoid violence in the first place. Even if you legitimately use force in order to escape imminent and unavoidable danger you still have to live with the physiological, psychological, and litigational results of doing so. That is not to say that you will never have to use deadly force, of course. If you do engage in a battle for your life, a solid understanding of your local self-defense laws can help you avoid winning the fight only to lose your freedom (and/or everything you own) in the courts afterward. I am a martial artist not an attorney, so nothing in this article should be construed as a legal opinion nor should any of its contents be treated as such. Having said that, however, the classic rule is that self-defense begins when deadly danger begins, ends when the danger ends, and revives again if the danger returns. Neither a killing that takes place after a crime has already been committed, nor a proactive violent defense before an attack has taken place is legitimately self-defense in the eyes of the court. A person can only resort to deadly force in order to escape imminent and unavoidable danger of death or grave bodily harm. An attacker must not merely have made a threat to attack you, but must also be in a position where he or she is obviously and immediately capable of carrying out that threat and/or has begun to do so. The cornerstone of a legitimate claim of self-defense is the innocence of the claimant. A person must be entirely without fault. If a martial artist begins a conflict, he or she cannot claim self-defense. If the practitioner allows a conflict to escalate into a lethal situation when it could have been avoided, he or she shares some degree of culpability and, once again, cannot claim self-defense. This cannot be overemphasized. There are countless stories of martial artists picking fights they regret for the rest of their lives because people were maimed or killed and the practitioners are subsequently sued or jailed or both. You cannot afford to let your ego overrule your common sense. Depending on the circumstances, almost any form of physical assault can be considered deadly force. In Washington State (RCW 9A.16.010) deadly force is defined as, "the intentional application of force through the use of firearms or any other means reasonably likely to cause death or serious physical injury." Other jurisdictions will have similar definitions. In general, any blow delivered powerfully and deliberately to a vital part of the body may be construed as deadly force so long as it can be shown that it was struck with the intention, or predictable likelihood, of killing. Since that is exactly what most of us train to do, we must be prudent in the application of force outside the training hall. The courts are more likely to interpret a blow as deadly force if the person delivering it is physically much stronger than the victim, a professional fighter, a trained martial artist, or an assailant who attacks with extreme savagery. An example of extreme savagery in the eyes of the law would be gratuitously raining blows upon a fallen opponent who has obviously given up the conflict, even if he or she started the fight in the first place. While a great majority of deadly force cases involve the use of weapons, martial artists stand a good chance of being charged with a crime resulting from an unarmed confrontation, especially if their training background is uncovered. Knowing that, your best strategy to avoid such unpleasantness is simply never to overreact. Equal force doctrines require law-abiding citizens to respond to an attack with little or no more force than that which he or she perceives is being used against him/her. In some places, the law clearly specifies that equal force must be exactly equal. The attacked can respond with no more force than that by which he or she is threatened - slap for slap, punch for punch, kick for kick, or deadly weapon for deadly weapon. Disparity of force between unarmed combatants is measured in one of two ways. It exists if (1) the victim is being attacked by someone who is physically much stronger or younger or (2) the victim is being attacked by two or more assailants of similar or equal size. In such cases you may legitimately be able to exert potentially lethal force to defend yourself. Regardless, nowhere can a person legally respond to an assault of slight degree with deadly force. Practically you will usually want to respond to an assault with a degree of force sufficiently, but not greatly, superior to that with which you are threatened. There are two advantages to this 'slightly greater' degree of force doctrine: (1) it places the defender in a more secure tactical position, and (2) it discourages the assailant from continuing his or her attack and escalating into a position where lethal force is warranted. Under no circumstances, however, must you let fear of legal consequences keep you from surviving a violent encounter. A great majority of states require that law abiding citizens avoid conflict whenever possible. It is best to withdraw, leaving the scene entirely. Retreat from a belligerent party who threatens you unless the attack is so savage that there is not sufficient time to escape or unless withdrawing (or leaving cover in the case of a gunfight) would increase your vulnerability. The only exception to this rule is within the confines of your own home (or in some places your place of business). In most cases if someone breaks into a person's home and assaults him or her, the homeowner does not legally need to attempt to retreat though in some cases it may be prudent to do so anyway. The bottom line is that in the eyes of the court you must also be in reasonable fear for your life prior to applying countervailing force. If you are cornered and have to fight, you clearly must use your skills to assure your safety and well-being. It is essential, however, to make a commitment to yourself to use them wisely. Furthermore, ensure than any students whose education is your responsibility will understand how to do the same.